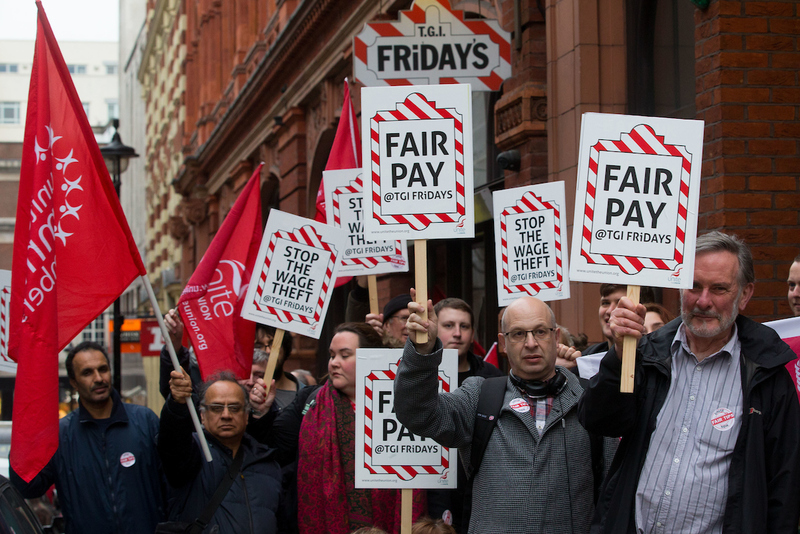 Dozens came out to protest TGI Fridays’ unfair tipping practices and unpaid trial shifts in a demo organised by Unite on Friday (April 13) outside the restaurant chain’s Covent Garden branch in London. 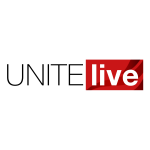 The Unite activists came out in solidarity with the TGI Fridays workers who from this week will be balloted for strike action in what may be the first strike at a casual dining chain in decades. 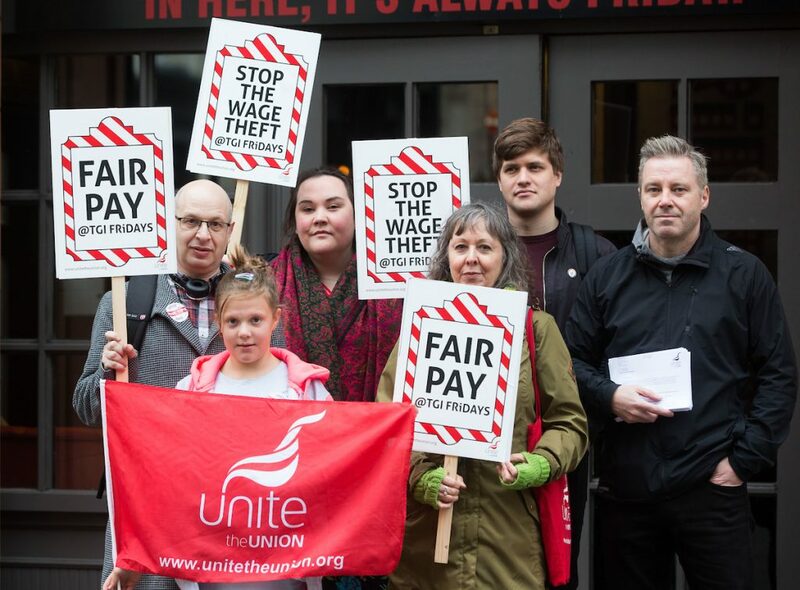 The activists and members, including from local Unite Community branches and from Unite’s Hospitality branch, held placards reading ‘Fair Pay’ and ‘Stop the Wage Theft’ (pictured above) as they sang chants and gave speeches. Protesters — both young and old — came out in solidarity with TGI Fridays waiters, who face having 40 per cent of their card tips taken and redistributed to kitchen staff in lieu of a pay rise. 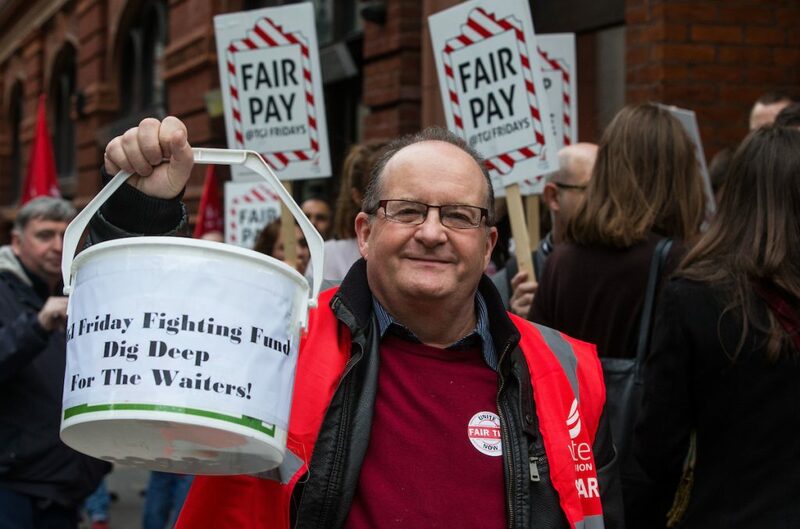 The chain has also come under fire for failing to pay prospective workers for trial shifts. “Standing up for your rights and challenging bad practice is hard when the threat of having your shifts cut or losing your job looms over you,” he added. “It takes courage to fight back, which is why these TGI Fridays’ workers and the McStrikers deserve our respect.